PRIME Minister Tun Dr Mahathir Mohamad’s visit to Senegal recently stirred more than just mild interest. His presence at the International Conference on the Emergence of Africa reminded me of the groupie-like fervor inspired by the Beatles or more precisely, the likes of when Nelson Mandela came to Malaysia in the late 1990s. As a Malaysian, it was humbling to see the outpouring of love and admiration for this fourth and seventh prime minister of ours. To Senegal, Dr Mahathir is a living legend, a man who had shaped Malaysia and guided its emergence as a world player and in the words of the economic adviser to the president — “The Father of Emergence”. From the moment he set foot in this West African country, Dr Mahathir was given all the due reverence normally reserved for the most exalted head of state, not a head of government. 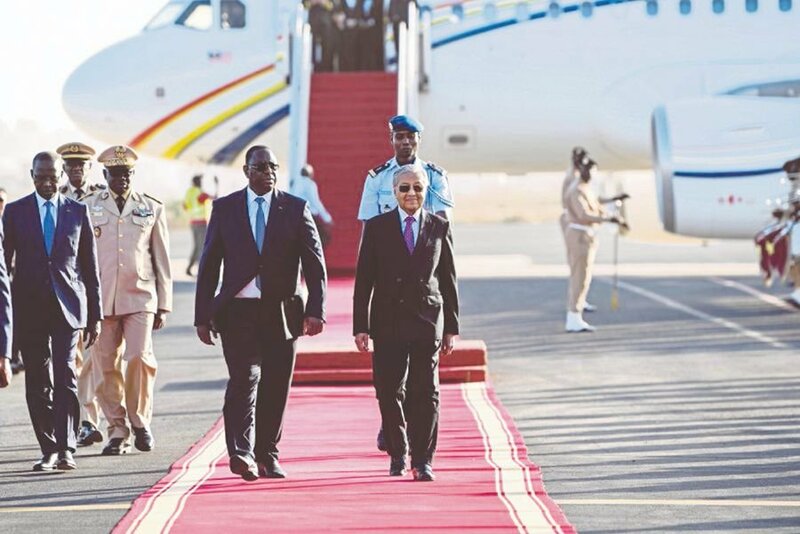 When Malaysia One landed on Jan 16, 2019 at the military airport of Dakar — the Leopold Sedar Senghor Airport—it came to a stop at the edge of a red carpet flanked by the Presidential Guards. This in itself was already an anomaly — the answer of which was immediately apparent moments later when President Macky Sall himself strode out of the presidential saloon to greet the plane on the tarmac. When Dr Mahathir cleared the last of the aircraft steps, the president walked with him to the dais in the middle of the red carpet walkway, and stood next to him for the state welcoming ceremony. Protocol-wise, this is the highest honour that a country can bestow upon a visiting dignitary. Normally a state welcoming ceremony is reserved for presidents and monarchs, as is the greeting on the tarmac by a president. The fact that Dr Mahathir’s visit was not even an official visit mattered little to the Senegalese — it was their right to treat the prime minister at the level of elder statesman, rather than a mere prime minister. Senegal’s First Lady, too, was gracious, waiting patiently as Tun Dr Siti Hasmah Mohd Ali gingerly made her way down the aircraft stairs, before warmly welcoming her to the country. It was a sight to behold as the president himself made the introductions of his ministers and advisers, who were in the receiving line at the end of the red carpet. You could literally see the joy and respect on the faces of the receiving line as they shook hands with Dr Mahathir. Inside the Presidential Pavillion, President Sall and the First Lady sat with Dr Mahathir and Siti Hasmah in a private room while in the open lounge outside, the prime minister of Cote d’Ivoire was entertained by the prime minister of Senegal. From there on, it was obvious that the prime minister of Malaysia was the star of the Senegal scene, despite the other heads of state and government who were also in town for the international conference. Everywhere that Dr Mahathir was, there were the red-robed Presidential Guards lining the walkway — at his hotel, as he arrived to the conference centre, at both the airports that he landed and took off from. It was unnerving to say the least, since the guards normally signal that the president is present in the building. Even in the conference centre, when the leaders were walking together, President Sall accompanied Dr Mahathir, while President Ibrahim Boubacar Keita of Mali and Prime Minister Amadou Gon Coulibaly of Côte d’Ivoire followed behind. The conference was to have been attended by many more presidents, but as it was, there was trouble in Kenya, Burkina Faso, and Cote d’Ivoire while President Paul Kagame of Rwanda had to chair an African Union emergency meeting in Ethiopia on the situation in Congo. These were some of the presidents that had confirmed their attendance to the conference upon hearing that Dr Mahathir would be one of the speakers. Dr Mahathir’s presence at the conference was very much anticipated. Many Senegalese and foreign diplomats were to later admit that they attended the conference because they wanted to hear the pearls of wisdom from the statesman himself. Dr Mahathir did not disappoint, despite the short time frame given to him to respond to the questions posed. His second intervention, about Japan Incorporated and the Malaysia Incorporated concept, received thunderous applause. When it was time to leave Dakar, Prime Minister Mohamad Dionne of Senegal insisted on travelling with Dr Mahathir to the airport, for a proper send-off. A few ambassadors from Dakar’s diplomatic community had congregated at the airport to say farewell to Dr Mahathir. As Dr Mahathir climbed the aircraft stairs and turned to wave to the crowd, the Presidential Guards lining the red carpet stood at attention and lowered their swords in solemn tribute. Even though Dr Mahathir was in Dakar for slightly more than 24 hours, he left an indelible mark on the Senegal scene. It is now up to us — the civil servants, the business leaders, and the civil society in general — to leverage upon the visit to our advantage.